The Movie Poster »Back to the Future Part III« for the Movie »Back to the Future Part III« from Director Robert Zemeckis on CAFMP – Central Archive for Movie Posters. We are on a great way - more than 80 percent finished! They've saved the best trip for last... But this time they may have gone too far. 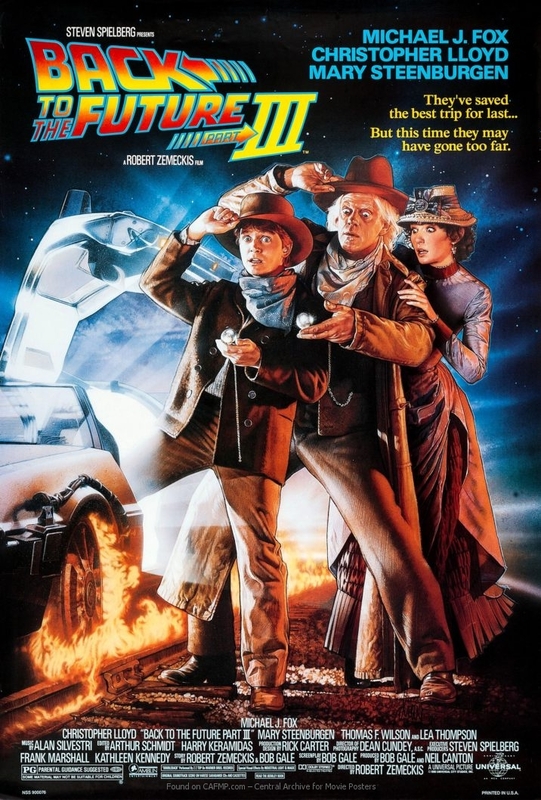 Poster »Back to the Future Part III« from movie »Back to the Future Part III« on CAFMP - Central Archive for Movie Posters with the star Christopher Lloyd and Mary Steenburgen and Michael J. Fox on it. Please note: You are about to vote for the poster art, not the movie »Back to the Future Part III«. This way we can publish highlights of a particular year and also present your all-time-favorites. If you found a mistake in our data for the Poster (Back to the Future Part III) just send us corrections or further information with this form. This is NOT a comment form. For release comments to the posters scroll down. The copyright © of all movie posters is held by the holders of the respective property rights. And notice: cafmp.com is NOT a commercial site.